My biggest pet peeve is seeing a raw tomato on a menu when it is clearly not in season. Tomatoes not in season are mealy, have little taste and just plain old bad. Why, why, why would you do it? Having said that, one of my most favourites is the Insalata Caprese. Our new hot spot restaurant in Toronto (Bar Mercurio) has by far, one of the best Insalata Caprese I have ever tasted and I am not kidding. And this salad is consistently amazing, whether the humble tomato is in season or not! Dare I share their secret? Oven Roasted Tomatoes. There I said it. Slow roasting your sliced tomatoes over a long period of time will bring out the sugars and caramelize this lovely fruit to a point where it really doesn’t matter what it tastes like raw! Paired with some fresh buffalo mozzarella, fresh basil, a little spicy arugula and drizzled with EVOO and good quality aged balsamic…well, I have died and gone to heaven! Line the cookie sheet with parchment. Install the cooling rack onto the cookie sheet. Spray the cooling rack with the non-stick spray. Dry each tomato slice, both sides. Place the tomato slices on the rack so that they are not touching. Bake for 3-4 hours or until the edges become caramelized. You may wish to flip the tomatoes half way during the baking period. Yum! These tomatoes look great. Thanks for referring me to this recipe Eva! I agree with you completely – give me great tomatoes, or NO tomatoes! I was lucky enough to live in Italy for several years and love caprese salad! 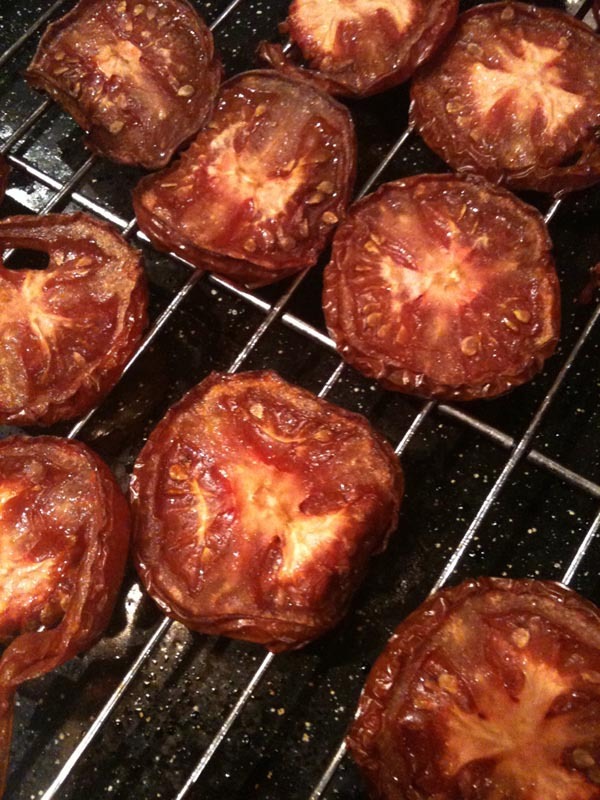 What a lovely idea to slow-roast the tomatoes! I am an enthusiastic home-cook with doctors orders to lose weight….so I started blogging about it (my first week). Please come check it out, enjoy the recipes and maybe subscribe! Any tips or hints would appreciated – your blog is beautiful! Thanks for your comment. We women always struggle with our weight; I congratulate you for taking the first step. Check out my page about tips and tricks to manage your weight. I did – and I agree with all of them. I know exactly what I need to do….it was a matter of inspiration and accountability that could only come from inside. Doing a blog gave that to me! Have a great day!